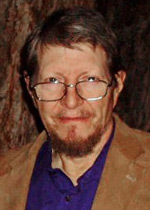 Lester Neil Smith III, better known as L. Neil Smith, is a libertarian science fiction author and political activist. His father was in the Air Force, so he grew up all over the North America in places like Waco, McQueenie, and La Porte, Texas; Salina, Kansas; Sacramento, California; and Gifford, Illinois--all before he was in 5th grade--and then St. John's, Newfoundland and Ft. Walton Beach, Florida where he graduated from high school. Along the way, Neil acquired a deep interest in science and history, and studied Latin and German. He began shooting when he was around 11 years old, through a joint program of the National Rifle Association and the Boy Scouts of America. Ultimately, he won the rank of Eagle Scout and "more sharpshooter bars than I can remember". Greatly preferring science fiction to anything else, Neil's boyhood favorites were Arthur Clarke, Theodore Sturgeon, Isaac Asimov, Richard Wilson, Robert Scheckley, and of course, Robert Heinlein. His works include a trilogy of Lando Calrissian novels. He also wrote the novels Pallas, The Forge of the Elders, and The Probability Broach, each of which won the Libertarian Futurist Society's annual Prometheus Award for best libertarian science fiction novel. He is also a founder of that award. Music--primarily guitar and banjo--has always been a large part of Neil's life. (Lyrics to several of his songs may be found in his novel The War Dove.) In high school and college, he led a number of small groups and bands including the Shady Grove Singers, The Roughriders, and the Original Beautiful Dreamer Marching Jug Band. His first "real" job was as a banjo player at a Shakey's pizza parlor.